I wrote this function when I was analyzing data from one of my experiments. In the experiment, participants had to guess which of two options was correct based on a stream of incoming evidence. The drift-diffusion plots represented their guesses (ranging from 100% certain option A was correct to 100% certain option B was correct) over time. You can view and download the Jupyter notebook I made to create the plots here. First, we'll import libraries, define some formatting, and create some data to plot. Creates a formatted drift-diffusion plot for a given timeseries. You can specify if the plot should have sticky bounds or not. Setting stickybounds=TRUE prevents the time series from moving away from a bound once it is reached. This is equivalent to forcing "decisions" to be final. Setting stickybounds=FALSE allows the time series to move away from a bound. You can customize the plot in several ways. First, you can pass in any of the kwarg arguments accepted by Matplotlib in the drift_diffusion_plot function. Here's a list of arguments you can pass in. Second, the function returns a handle to the plot's axis that you can use to further adjust the formatting. We can also plot the individual time series in two or more color-coded groups. When I entered graduate school, I knew next to nothing about functional magnetic resonance imaging (fMRI) and it's history. I eventually began to piece together a picture of fMRI's more recent history as I started to notice certain topics permeating conferences, classes, and conversations. Even so, I've long been curious about what topics shaped the fMRI and MRI literatures over time. When I learned about burst detection, I immediately wanted to use the method to create a data-driven timeline of fMRI. I used the PubMed database to collect the titles of MRI articles. I searched for the terms "fMRI" or "MRI" in the title/abstract field and restricted the results to articles and review papers published between 01/01/1987 and 11/30/17 and written in English. PubMed expanded the search to documents including the phrases "magnetic resonance imaging" or "functional magnetic resonance imaging" in the title or abstract. The search returned a total of 410,100 documents (accessed on 12/15/2017). I only kept articles with publication dates that included a month and a year. Articles that had no publication date at all, no publication month, a season rather than a month, or that were published outside the date range were discarded, leaving a total of 371,244 documents. If we look at how many MRI articles were published every month during the timeframe, we can see an almost linear (maybe exponential) increase in the number of articles published from 1987 to 2015, and then a slight decline. I don't know if this decline is due to some shift in the field -- maybe fewer articles contain the terms "fMRI" or "MRI" now or maybe fewer fMRI articles are being published -- or if it's reflective of some sort of delay in PubMed's indexing of articles. It looks like approximately (a whopping!) 2000 MRI and fMRI articles have been published every month since 2014. That is much more than I would have guessed. Granted, these may not all be actual MRI or fMRI studies. The search returned all documents that contained fMRI or MRI in the title or abstract, but it's unclear whether those articles published new results or simply referenced previous studies. Since this analysis tracks how often different words appear in MRI article titles over time, I first had to preprocess the titles in the dataset. Preprocessing was pretty minimal -- I simply converted all words to lowercase, stripped all punctuation, and split each title into individual words. The titles in the dataset contained 101,843 unique words. A large chunk of these words only appeared a few times. Since I'm interested in general trends, I don't really care about words that rarely appear in the literature. In order to weed out uncommon words and reduce computation time later on, I discarded all words that appeared fewer than 50 times in the dataset. That left 6,310 unique words. One thing about this list I found surprising is how medically-oriented most of the terms are. Since I'm surrounded by researchers who use fMRI to study cognition, I expected words like memory, executive, network, or activity to top the list, but they don't even appear in the top 50! I suspect there are two primary factors contributing to the medical nature of these words. First, the articles returned by searching for "MRI" are likely to be medical in nature since MRI has a myriad of medical imaging applications, including detecting tumors, internal bleeds, demyelination, and aneurysms. Accordingly, some of the most prevalent words reflect these applications, such as cancer, spinal, tumor, artery, lesions, sclerosis, cardiac, carcinoma, breast, stroke, cervical, and liver. Second, I used the full dataset -- which spanned 1987 to 2017 -- to identify the most common words, which biases terms that were prevalent throughout the full period. Since functional imaging didn't become widespread until a few years after anatomical imaging, it's less likely that functional-related terms would make into the most common words. 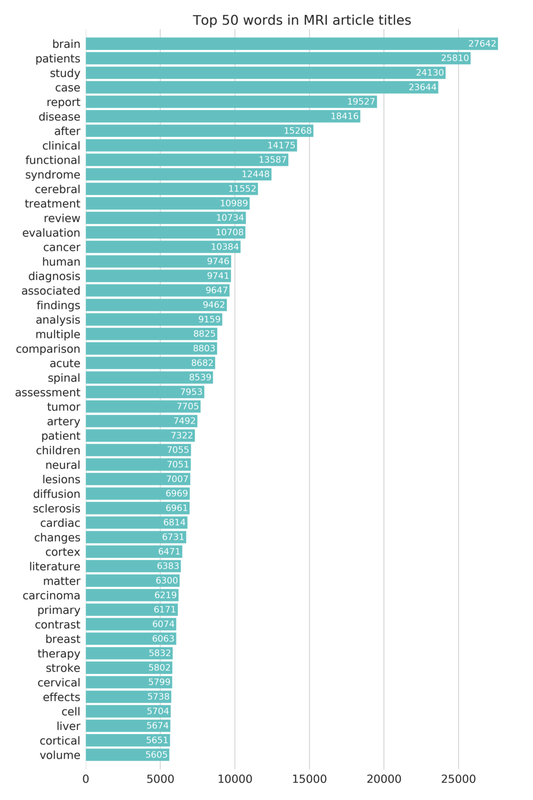 This chart illustrates that the terms brain, patients, and study have been and still are the most popular words in fMRI and MRI article titles. In comparison, the popularity of case has declined over the last few years. In 2007, it was just as common as brain, patients, and study, but by 2017 it is used nearly 50% less often than these other terms. The terms disease, after, clinical, cancer, report, and syndrome all saw small dips after 2016 after long periods of continual increases, which may reflect the dip in the number of articles published in 2016 and 2017 (it may also reflect the fact that the data for 2017 doesn't include December). The term functional saw a large gain in the last 10 years, rising from the 9th spot in 2007 to the 4th spot in 2017. This may reflect the growing proportion of fMRI papers in the MRI literature or it may reflect the growing popularity of functional connectivity. This differs from angiography and connectivity, which appear in the dataset about as frequently as carcinoma (the dotted lines represent the overall fraction of titles that contain each word), but are characterized by different time courses. Angiography was popular in the 1990s, but has since become less popular. In contrast, connectivity was virtually unused before 2005, but has since seen a meteoric rise. To find fads in the MRI literature, we can turn to burst detection. Burst detection finds periods of time in which a target is uncharacteristically popular, or, in other words, when it is "bursting." In our case, the target is one of the unique words in the dataset and we are looking for periods in which the word appears in a greater proportion of article titles than usual. The two-state model that I used assumes that a target can be in one of two states: a baseline state, in which the target occurs at some baseline or default rate, and a bursty state, in which the target occurs at an elevated rate. For every time point (in this case, for every month), the algorithm compares the frequency of the target at that time point to the frequency of the target over the full time period (the baseline rate) and tries to guess whether the target is in a baseline state or a bursty state. The algorithm returns its best guess of which state the target was in at each time point during the time period. In the example above, we would not expect carcinoma to enter a bursty state because the proportions don't get much greater than the baseline proportion (gray dotted line). However, we would expect connectivity to enter a burst state some time around 2014 because the proportions begin to far exceed the baseline proportion (blue dotted line). There are a few parameters you can tweak in burst detection. The first is the "distance" between the baseline state and burst state. I used s=2 which means that a word has to occur with a frequency that is more than double its baseline frequency to be considered bursting. The second is the difficulty associated with moving up into a bursty state. I used gamma=0.5, which makes it relatively easy to enter a bursting state. Finally, I smoothed the time courses with a 5-month rolling window to reduce noise and facilitate the detection of the bursts. I applied the same burst detection model to all 6,310 unique words in the dataset to determine which terms, if any, were associated with bursts of activity and when those bursts occurred. The vast majority of terms were not associated with any bursts, but a handful of terms did exhibit bursting activity. Below is a timeline of the top 100 bursts. Each bar represents one burst, with previous bursts in gray and current bursts (those that are still in a burst state as of November 2017) in blue. Since the time courses were smoothed, the start points and end points of the bursts are not precise (notice how the current bursts end in mid 2017). This analysis reveals a beautiful progression in the MRI literature. Imaging-related terms trend early on, with tomography, computed, resonance, mr, magnetic, nmr, nuclear, imaging, and ct bursting in the late 1980s and early 1990s. Medical terms begin to appear in the mid-1990s, including tumors, findings, evaluation, and angiography. The early 2000s are punctuated by advances in MRI technology, as demonstrated by bursts in the terms fast, three-dimensional, gamma, knife, event-related, and tensor. Bursts after 2010 capture the cognitive revolution ushered in by fMRI, with bursts in the terms cognitive, social, connectivity, resting, state, altered, network, networks, resting-state, default, and mode. To get an idea of how well the algorithm identified bursting periods, I plotted the proportions of the bursting words throughout the time period. Since there's great variability in the baseline proportions of the words, I normalized the monthly proportions by dividing them by each word's baseline proportion. Values of 1 indicate that the proportion is equal to the baseline proportion, values less that 1 (light blue) indicate that the proportion is less than the baseline, and values greater than 1 (dark blue) indicate that the proportion is greater than the baseline. The boundaries of the bursts are outline in black. I think the lesson here is that if you want your research to be on the cutting edge, you need to write a paper titled "Accuracy and prognostic outcomes of simultaneous multi-parametric measurements for systematically predicting adolescents' resting-state networks and prostate cord fat." .... At least, I think that's the takeaway. Connectivity is the obvious break out star, appearing in less than 0.5% of articles in 2002 and nearly 4% of articles in 2017. I could probably make another half dozen graphs, but I'll stop myself here. Let me know what you thought about this analysis or if you have ideas about additional things to look at. Next I'm going to work on applying the same analysis to identifying trends in the New York Times news article archive. After a quick Google search, I realize that there may not be such a thing as an arrow plot and I may have made up the term. Regardless of whether it's an actual type of plot or not, I've found them useful in visualizing changes in some variable across individuals and this post describes how to make them in Python. 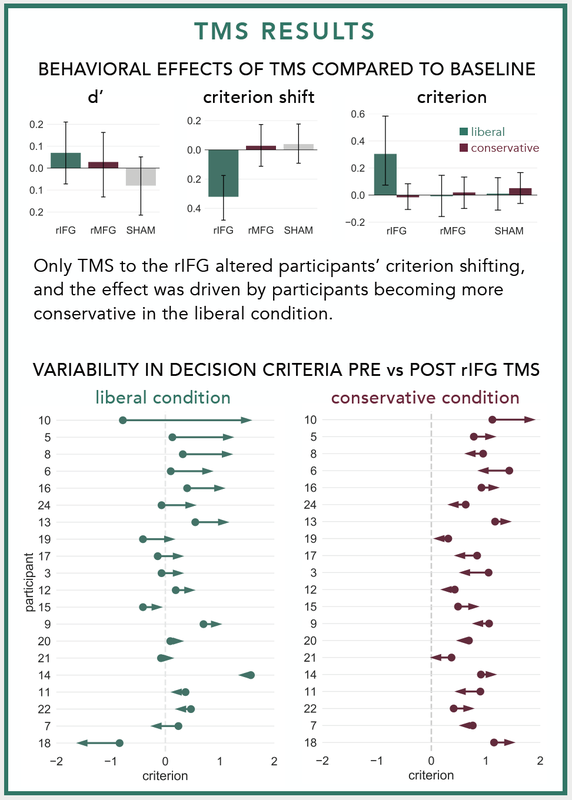 The dots in the arrow plots denote the participants' decision criteria before stimulation and the tip of the arrow heads denote their decision criteria after stimulation. I use these plots often to visualize changes in participants' behaviors before vs. after neurostimulation, but they can be used in any situation where you need to illustrate how some variable changed among different entities. For example, you could use them to show how population changed among different US states, how mean salaries changed among different occupations, or how stock prices changed among different corporations. This is the same arrow plot I made for the ICB poster. The arrows start at the "before score" and end at the "after score." The participants are sorted according to how much their scores changed. This plot visualizes the change in scores, and not the scores themselves. It's effective if you want to emphasize the magnitude of change, and not the actual start points or end points. It looks cleaner, but it also conveys less information. 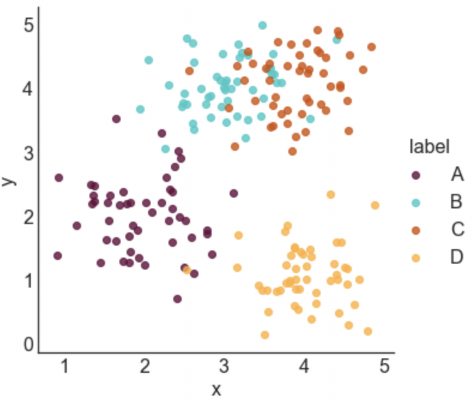 This tutorial shows you 7 different ways to label a scatter plot with different groups (or clusters) of data points. I made the plots using the Python packages matplotlib and seaborn, but you could reproduce them in any software. These labeling methods are useful to represent the results of clustering algorithms, such as k-means clustering, or when your data is divided up into groups that tend to cluster together. You can access the Juypter notebook I used to create the plots here. I also embedded the code below. Next, we need to generate some data to plot. I defined four groups (A, B, C, and D) and specified their center points. For each label, I sampled nx2 data points from a gaussian distribution centered at the mean of the group and with a standard deviation of 0.5. To make these plots, each datapoint needs to be assigned a label. If your data isn't labeled, you can use a clustering algorithm to create artificial groups. Seaborn makes it incredibly easy to generate a nice looking labeled scatter plot. This style works well if your data points are labeled, but don't really form clusters, or if your labels are long. This is a slightly fancier version of style 1 where the text labels in the legend are also color-coded. I like using this option when I have longer labels. When I'm going for a minimal look, I'll drop the colored bullet points in the legend and only keep the colored text. This option can work really well in some contexts, but poorly in others. It probably isn't a good option if you have a lot of group labels or the group labels are very long. However, if you have only 2 or 3 labels, it can make for a clean and stylish option. I would use this type of labeling in a presentation or in a blog post, but I probably wouldn't use in more formal contexts like an academic paper. This is my favorite style and the labeling scheme I use most often. I generally like to place labels next to the data instead of in a legend. The only draw back of this labeling scheme is that you need to hard code where you want the labels to be positioned. This style is advantageous if you care more about where the cluster means are than the locations of the individual points. I made the points more transparent to improve the visibility of the labels. This style is similar to style 5, but relies on a different way to improve label visibility. Here, the background of the labels are color-coded and the text is white. This style is a little bit odd, but it can be effective in some situations. This type of labeling scheme may be useful when there are few data points and the labels are very short. Hello, I'm Nikki. I'm a Data Scientist with a PhD in Dynamical Neuroscience. I love all things related to brains and to design, and this blog has a lot to do with both.